Risk assessment has become a dominant public policy tool for making choices, based on limited resources, to protect public health and the environment. It has been instrumental to the mission of the [USEPA] as well as other federal agencies in evaluating public health concerns, informing regulatory and technological decisions, prioritizing research needs and funding, and in developing approaches for cost-benefit analysis. Assessment of the risk of human exposures to chemical contaminants in the environment generally follows the framework set forth by the NRC (NRC 1983). USEPA’s human health risk assessment web page also includes information about risk assessment. Figure 1-1 illustrates the risk assessment process in the context of risk management. Figure 1‑1. Risk assessment process. Source: ITRC RISK-3, Adapted from (Commission 1997). Risk assessment is an integral component of risk management [for contaminated sites because it] provides a scientific and defensible rationale to support decisions for the protection of human health and the environment. 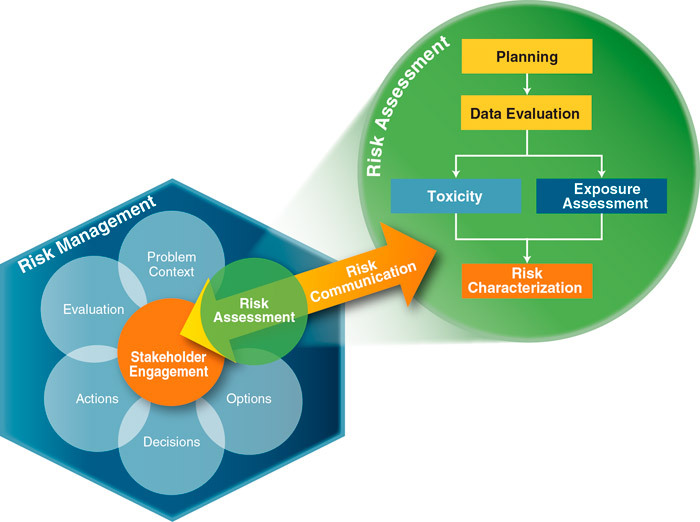 Risk assessment is interconnected with risk communication and other components within the interactive, decision-making process for risk management (ITRC (2015)). Bioavailability considerations are part of both the dose-response assessment and exposure assessment components of the risk assessment process; see the discussion of relative oral bioavailability for more information. Understanding the bioavailability of the contaminants in the soils at a site also supports risk-based decision making. The National Academy of Sciences defined “bioavailability” as the “individual physical, chemical, and biological interactions that determine the exposure of plants and animals to chemicals associated with soils and sediments” (NRC 2003). Contaminant bioavailability has implications for a broad range of receptors, in both human health and ecological risk assessment. Similarly, bioavailability considerations may be relevant to assess potential risks from diverse environmental media. This guidance specifically addresses the bioavailability of chemicals in soil as part of a human health risk assessment, with a focus on incidental ingestion of soil. This guidance describes the state of the science for incorporating bioavailability considerations into the human health risk assessment process, including the appropriate use of bioavailability, and potential methods to estimate bioavailability, such as in vitro bioaccessibility tests. For additional information about human health risk assessment (see ITRC RISK-3). Humans may be exposed to soil via incidental ingestion, intentional ingestion, inhalation, and dermal contact. Intentional ingestion (for example, individuals with pica disorder) generally falls outside of the conventional risk assessment efforts for contaminated sites, except to evaluate acute risk on a case-by-case basis. Only particles with an aerodynamic diameter smaller than 100 µm can be inhaled (Nieboer et al. 2005), thus only a small mass of soil contributes to exposure by inhalation and pulmonary deposition. For some chemicals, specific toxicity criteria exist to evaluate inhalation exposure risk, and for those chemicals the inhalation pathway can dominate risks. Larger particles (usually > 10 µm) that are inhaled and deposited higher in the respiratory system are generally assumed to be transported out of the lungs to the digestive system. While a small mass, these particles ultimately contribute to the ingested fraction of soil (WHO 1999). For this guidance, direct ingestion and dermal contact are the soil exposure pathways for human health risk for which bioavailability considerations are most relevant. Many of the soil-chemical interactions that affect the oral bioavailability of chemicals from soil are also likely to affect systemic absorption following dermal soil exposure. The research methods used for assessing percutaneous absorption of chemicals from soil, however, are substantively different from (and less developed than) the methods for assessing oral bioavailability. Therefore, this guidance focuses on the factors that affect the contaminant bioavailability of ingested soil. This guidance also contains some information about PAH dermal exposure because it is an important contributor to total systemic exposures under default exposure assumptions from USEPA. This guidance does not discuss the dermal route for arsenic and lead because the dermal exposure route does not result in the lowest risk-based screening level for these metals. As USEPA (2004) notes, for inorganics, the compound speciation is critical to dermal absorption and insufficient data are available to extrapolate reasonable default values. For example, the default dermal absorption value of 0.03 that USEPA (2016f) currently uses for arsenic in the regional screening levels (RSLs) leads to dermal RSLs that are almost 10 times higher than the ingestion RSLs. Given this difference, further evaluating the bioavailability of this fraction is of little value for understanding ingestion exposures, although some relevant research is available, for example, (Lowney et al. 2007). Soil-to-Plant-to-Human Exposure Pathway. Some edible plants do take up and accumulate contaminants. A plant’s uptake of contaminants depends on many factors, including the [specific contaminant,] type of plant and the pH and organic content of the soil. However, research shows that there is minimal risk of exposure from eating plants grown in contaminated soils. To reduce concerns of exposure from eating plants, wash produce thoroughly before eating to remove potential soil contamination. Root vegetables have a higher potential for accumulating contaminants. In some cases, it may be prudent to avoid growing edible plants in soils with high contaminant concentrations. More information on exposures by both pathways (ingestion of soils adhered onto vegetables and chemicals absorbed into vegetables) can be found in several recent articles and case studies on urban gardening (Brown, Chaney, and Hettiarachchi 2016; Raes Harms et al. 2014; Minca, Basta, and Scheckel 2013; Obrycki 2017; Attanayake et al. 2015; Wortman and Lovell 2013). The ITRC guidance on contaminated sediments (CS-1) addresses the issue of bioavailability of contaminants in sediments and focuses on ecological receptors. The pathways and processes that influence bioavailability of chemicals in soil differ sufficiently from those in sediment systems to require a separate guidance. The bioavailability of contaminants in soils has implications for both ecological and human health risk assessments. Exposure pathways, intake rates, and physiological considerations vary between humans and other receptors. The assessment of the bioavailability of chemicals in soil to ecological receptors is a well-defined and distinct area of research. For example, Anderson, Farrar, and Zodrow (2013) have conducted a review and meta-analysis of soil-metal bioavailability studies and corresponding considerations to terrestrial ecological risk assessments. Although some bioavailability principles used in human health risk assessment could be applied to ecological receptors, it is beyond the scope of this guidance to evaluate specifically when and to what extent such extrapolation is possible.